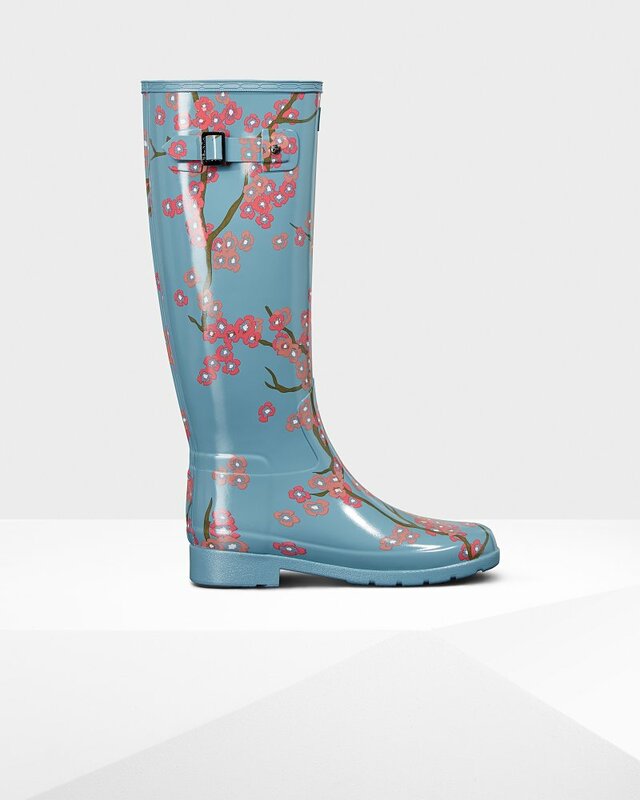 Women's Refined Blossom Print Tall Rain Boots is rated 5.0 out of 5 by 1. This patterned waterproof boot offers a feminine take on Hunter's classic Refined Tall Rain Boot. Handcrafted from natural vulcanized rubber with a ditsy blossom print, this festival friendly welly features a slim fit, a moulded foot bed, and a gloss finish. Rated 5 out of 5 by waldo from Love them but slippery as all heck I'm super happy with this product!! They keep everything out aside from my feet! The only issue I have with them is that each time I take my dog outside, I darn near break my neck slipping on the stairs that go down to my backyard. I have to make sure my footing is correct or WHOOPS there I go again. Thanks god for railings. Otherwise I'd actually have died, falling down 3 flights of stairs. You've done good Hunter, maybe just some extra grip.